Pick up the gems, avoid baddies, and free gold bags for points or for dropping them on enemies' heads. 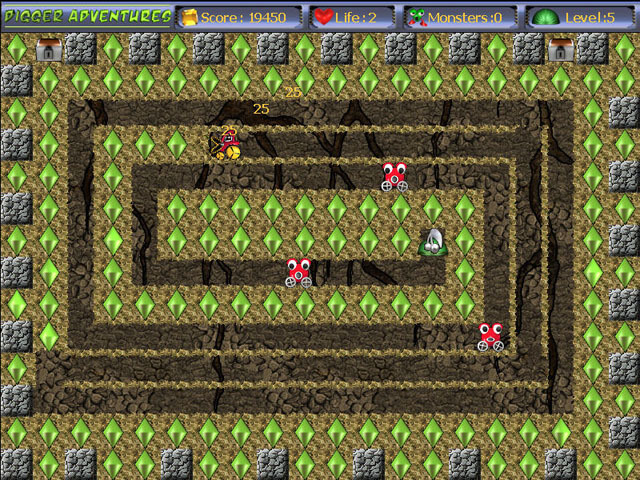 This new innovative remake of the original concept includes a variety of skins for the central character, configurable playing speeds, an auto-save feature, a special difficulty level for kids, multiple campaigns containing 30 levels each, hard-to-dig stones, new bonuses (for example, a cherry, enabling Digger to eat enemies) and more. ...... for kids, multiple campaigns containing 30 levels each, hard-to-dig stones, new bonuses (for example, a cherry, enabling Digger to eat enemies) and more. The action is viewed from a two-dimensional side perspective, a la Dig Dug and other classic arcade games. Qweas is providing links to Digger Adventures 2011 as a courtesy, and makes no representations regarding Digger Adventures or any other applications or any information related thereto. Any questions, complaints or claims regarding this application Digger Adventures 2011 must be directed to the appropriate software vendor. You may click the publisher link of Digger Adventures on the top of this page to get more details about the vendor.